Mary A. Pipetti, 98, Altoona, passed away Saturday at The Lutheran Home at Hollidays­burg. 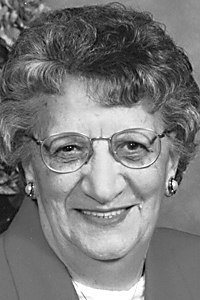 She was born in Altoona, daughter of the late Thomas and Rosa (Carbone) Caporuscio. On June 1, 1946, she married Louis Pipetti at Our Lady of Mount Carmel Catholic Church, Altoona. He preceded her in death on Jan. 27, 1987. Surviving are a daughter, Carole Pipetti of Altoona; two sons: Joseph of Williamsburg and Richard (Arlene) of Hollidaysburg; four grandchildren: Christina, Ryan, Casey and Anthony Pipetti; and numerous nieces and nephews. She was preceded in death by two sisters: Anna Merilli and Helen Martin; and four brothers: Nicholas, Joseph, John and James. She was the last member of her immediate family. She was a 1940 graduate of Altoona High School. She retired as a cafeteria aide from the Altoona Area School District in 1985 and had been previously employed by the Pennsyl­vania Railroad and Puritan Sportswear. She was a member of Our Lady of Mount Carmel Catholic Church, Altar and Rosary Societies and the Family Life Committee. Mary was a loving wife, mother and grandmother who enjoyed spending time with her family. Friends will be received from 4 to 8 p.m. Tuesday, Dec. 4, 2018, at Santella Funeral Home, where a vigil for the deceased will be held. A funeral Mass will be celebrated at 10:30 a.m. Wednesday, Dec. 5, 2018, at Our Lady of Mount Carmel Catholic Church. Committal will be at Calvary Cemetery.